A version of this article first appeared in Winestate magazine, Nov/Dec 2012. France and Spain each have an appellation based on schist that produces some extraordinary, bold, yet fine-textured red wines, with suppleness and surprising fragrance to the fruit for warm regions. 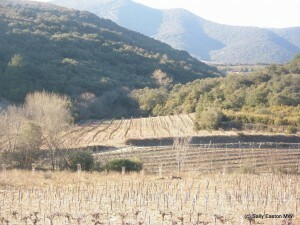 They are not the only appellations with schist (Alsace, Beaujolais, Loire valley, northern Rhône, for example), but both Faugères in southern France’s Languedoc and Priorat in north-east Spain, about two hours’ drive south west of Barcelona, are based almost entirely on surface-rocky schist ground. Schist is crystalline, layered rock similar to slate that has been metamorphosed by intense pressure. It is rich in mica and similar minerals. Such rocky schist which glistens with quartzite crystals provides one of the defining characters for Priorat terroir. Álvaro Palacios, of his eponymous property, described his terroir, saying it is ancient “metamorphic rock, formed 5 to 50 kilometres under the earth’s crust where two horizons of limestone had compacted a layer of clay.” Subsequent tectonic movement have brought it to the surface. Palacios added “it has three times more metals and minerals than sedimentary rock” that has not undergone metamorphosis. Possibly unsurprisingly, both appellations are based on a broadly similar blend of black grape varieties including carignan and grenache as major components in both, plus cinsault, mourvèdre and syrah in Faugeres, and international cabernet sauvignon, merlot and syrah in Priorat. Both appellations are also, coincidentally around the same size at 2,000 hectares. 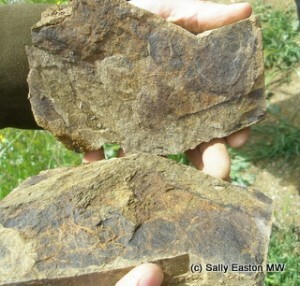 Both regions can be pretty dry too in summer, Priorat has less than 400mm of annual rainfall, but a characteristic of schist are the fine clays held between the layers of rock. These retain moisture for vine roots to search out and use over the growing season. Where the regions differ hugely is in the fashion stakes. Priorat wines have reached the repute of much-sought-after, and many have the prices to match. In 2000 it became only Spain’s second DOCa, alongside Rioja, the highest level of appellation possible. On the other hand, Faugères fundamentally lacks the trend status of Priorat. However, given that Priorat’s fortunes reversed just a generation ago, perhaps it won’t be that long before the wines of Faugères are equally famed.